Robert Heavens in front. 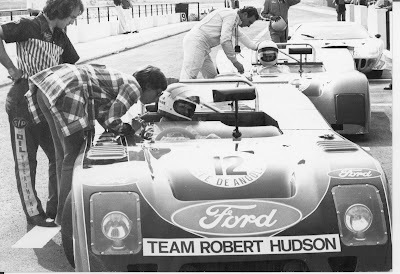 Behing my friend John Rowe in Chevron B19 with John Truter in white overall (co-driver) talking to him. A foto lhe foi presenteada por John Rowe. Aparentemente, esta foi a prova de 3h em Luanda de 1973, que acabou tendo apenas 2h.